As new organisms are identified throughout the world, there has been an ever-increasing need to investigate and research these diseases. New facilities have been designed and built to allow for the safe growth and study of these pathogens. This has led to an equally important need to safely destroy and dispose of these organisms without putting the public at risk. EWI’s systems have been carefully designed to minimize handling and to fully sterilize both solid and effluent waste streams from these facilities. EWI uses its patented Microwave distribution chamber to sterilize fluid effluent being held in a contamination chamber. Testing has shown that with a combination of thermal heat and microwave energy the EWI systems have a high sterilization efficacy when compared to conventional thermal systems. The EWI patented system also reaches the sterilization level of conventional systems at a lower temperature and in less time. High temperatures are used in this process to kill all pathogens contained within the effluent. Both assemblies used to sterilize the wastewater, the FS-6000 and the FS-POD, are automated. No manual material handling is required. This ensures the safety of the operators and handlers during the course of the process. Take a closer look at how our units operate. 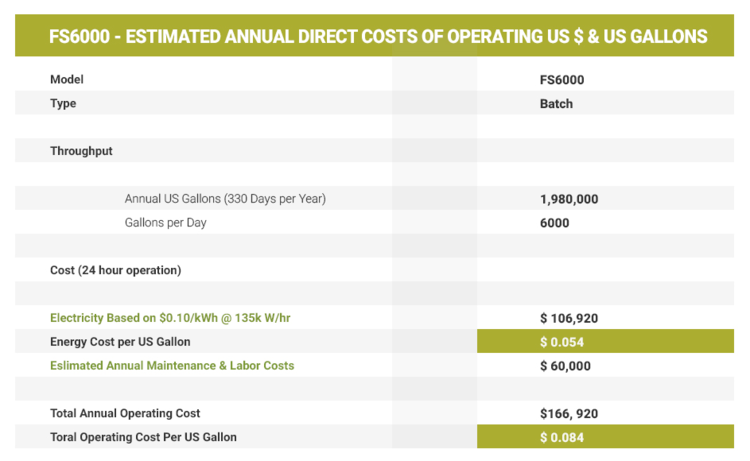 One of the biggest concerns for any investor is the cost of operation for wastewater sterilization units. The FS-6000 is surprisingly inexpensive, with an average cost of $0.084 per US gallon of waste water. The table to the right shows the breakdown of estimated costs for this unit. From an investment standpoint, EWI’s FS-6000 unit is worth the capital. From a safety standpoint, the EWI Systems are the best in class.